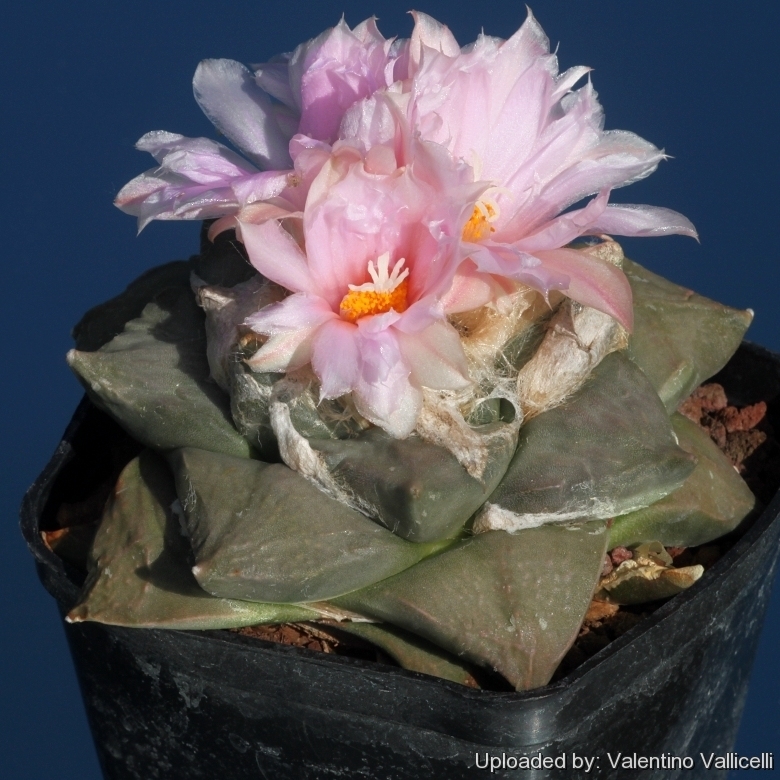 Description: It is a small slow growing solitary "living rock" cactus obtained by crossing ♀ Ariocarpus fissuratus var. lloydii x ♂ Ariocarpus retusus. The superb features of this rare plant are due to the intersection between the traits of the ancestors. It has inherited by Ariocarpus retusus the triangular tubercles which are however more stocky and rounded like in Ariocarpus lloydi with slightly papillate surface. The flower are also very beautiful. This hybrid is very variable and differences among specimens may be considerable. Habit: It is a geophyte plant that produces a small star-shaped rosette of rough fleshy tubercles. Stem: Subglobose, flattened on top, 5-10 cm high, that grows extremely slowly, to 10-15 (or more) cm in diameter. The stem is usually solitary, rarely giving rise to side shoots from old areoles. Tubercles: Imbricated, triangular, but more rounded than in Ariocarpus retusus, broad at base and usually acute at the apexes, flattened to convex adaxially, greenish-brown, greyish-green, yellowish-green or olive-green, irregularly papillose (or are only weakly fissured) in the surface which form transversal ledges and irregularly warty, usually as long as wide (to 3-4 cm long), and with the edges more or less acute. Areoles: Apical or sub-apical only in young specimens. Spines: It have no spines. Roots: Each plant has a large turnip-like taproot, which lies below the soil surface and serves for water storage. Flowers: These plants have a woolly crown, from which emerge white to pink flowers up to 5 cm in diameter, 2 times wider than long when fully expanded. Flowers last for 3 to 4 days.